While Holder months ago telegraphed his anticipated departure (and his to-do list for the closing chapter after nearly 40 years in government), it was clear that the nation’s first African-American attorney general and its first African-American president found their goodbyes painful to voice. Although Obama has known since the summer that his friend was serious about departing this year, there was no hint Thursday as to how long the president will take before announcing a replacement. The political calendar and partisan rancor about key issues at the Justice Department -- including the police shooting of Michael Brown in Ferguson, Mo. ; selective enforcement of certain laws; and the immigration and border security debate -- guarantee that any nominee will get a tough grilling on Capitol Hill. The Senate is in recess until after the November elections, and Republican lawmakers made clear Thursday they believe Obama’s next choice -- nominated before or after voters go to the polls -- should not be someone in Holder’s “ideological” mold. Under rules changed by the Senate Democratic leadership during this Congress to avert filibusters, nominees can be confirmed by a simple majority. For that reason, some analysts said they anticipate a confirmation showdown during the lame duck period in December, when Democrats will hold the majority before a new Senate, potentially controlled by the GOP, arrives in January. McConnell hopes to be re-elected in November, and if successful, aspires to become majority leader in January should Republicans have a net gain of at least six seats to take control of the upper chamber. 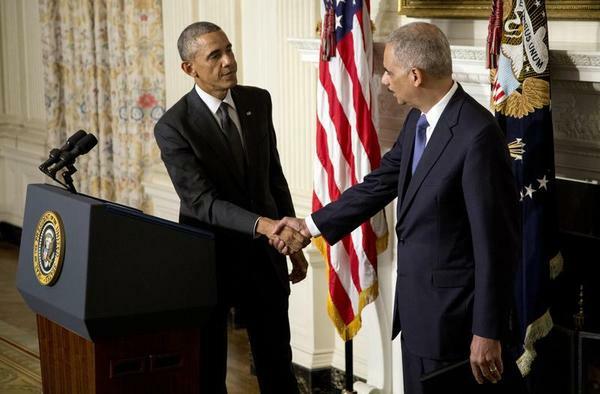 The political calculus to secure confirmation for Holder’s successor will be shaped by factors both in and out of Obama’s control. The names of men and women who suddenly appeared on lists making the rounds in the media -- California’s attorney general; the U.S. solicitor general; the Massachusetts governor; a Rhode Island senator; a former White House counsel; a New York prosecutor; the current secretaries of labor and homeland security -- seemed more about guesswork and ensuring diversity than a White House winnowing process using trial balloons. The president, even as he commended the attorney general on Thursday, has been weighing the achievable goals at the Justice Department during the time remaining in his term. Holder’s departure this year hints at considerations beyond the AG’s exhaustion with Washington, or the tradeoffs of accepting federal compensation well below that of white-shoe law firms. At Justice, calculations for significant new accomplishments on policy and legacy-building have ebbed, complicated by continued congressional gridlock, a conservative majority on the Supreme Court, and Obama’s waning clout. Holder did not say what he’ll do next, but he appeared to rule out political candidacy. And while he once served as deputy attorney general during the Clinton administration, he offered no thoughts about a future Democratic administration. He described his time in public service as coming to “an end,” adding he would continue “to serve” causes of legal justice that he said guided his career. The winding down of ambitions and the exodus of top aides are inevitable during second terms. Over the years, many former White House chiefs of staff have explained how second-term Cabinet officers become blockers -- tasked to hold ground for their bosses rather than put more points on the board. With Holder’s announcement, only Agriculture Secretary Tom Vilsack and Education Secretary Arne Duncan remain in the same slots as the original 2009 Cabinet team assembled by the president. Members of the Congressional Black Caucus, meeting Thursday in Washington, greeted the news of Holder’s impending departure with surprise and disappointment. Their belief has generally been that he championed their aspirations for racial, ethnic and gender-based justice and civil society, and distinguished himself by traveling to Ferguson to quiet national unrest in the wake of Michael Brown’s death. Obama will speak to the CBC on Saturday. Holder’s detractors were loud and persistent, and more than once Obama had to reaffirm his support for his attorney general. House Republicans voted to hold Holder in contempt of Congress in the wake of the gun-running scandal at Justice known as “Fast and Furious,” and Senate Republicans assailed him for what they said were illegal decisions in support of Obama’s political aims. Some progressives have been critical, as well. A few Democratic organizations responded to the resignation news Thursday by reminding the president about grievances over domestic spying, civil liberties, and at least one unfulfilled Obama campaign pledge. ACLU Executive Director Anthony Romero said Holder’s successor should give “adequate attention” to closing the Guantanamo Bay prison, where 149 detainees are still being held. It is a goal Obama has not met, despite administration efforts to transfer eligible prisoners out of Cuba to other countries. On national security and domestic intelligence issues, Romero assailed Holder, demonstrating in the process why the attorney general often found himself serving as Obama’s spear catcher. “During his tenure, DOJ approved the drone killing of an American far away from any battlefield, approved the NSA’s mass surveillance programs, failed to prosecute any of the Bush administration torturers, and presided over more leak prosecutions than all previous Justice Departments combined,” Romero said in a statement. “Five years later, he has failed utterly to hold the perpetrators of the crisis accountable,” said Public Citizen President Robert Weissman, who accused the attorney general of yielding to fears that top executives at financial institutions were “too big to jail,” ostensibly because potential market gyrations might put at risk economic momentum. “The U.S. Department of Justice declined to prosecute or even seriously investigate the Wall Street banks or their CEOs who crashed our economy and devastated communities across the country,” Weissman said in a statement.